Robert T. Hall, head of the Los Angeles Anti-Fakers League (or Anti-Fakers Society), says shots were fired at him as he returned from an outing to a friend’s summer camp, and he blames local spiritualists and mediums. He has been leading a crusade against fortune tellers, seers and other practitioners of the mystic arts and in heading for the end of the streetcar line in Edendale, he passed Semi-Tropic Park, a gathering place for spiritualists just outside the city limits, where such practices are regulated by law. Hall says he’s certain the spiritualists are to blame, adding that since he began his campaign, he has received many threatening letters. 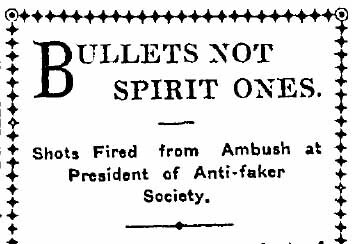 Amazingly enough, The Times published his address—and it would be interesting to know how many more threats he received after the paper said he lived at 1042 Santee St.
No one was ever arrested in the attack on Hall, who continued his campaign into 1908. At right, a sample of ads by mediums in 1908. This entry was posted in 1907, 1908, Black Dahlia, Crime and Courts, LAPD, Religion, Streetcars, Transportation and tagged #Fakes, #Hoaxes, 1907, 1908, religion, spiritualism. Bookmark the permalink.